Reflow Soldering « Global Market Insights, Inc. 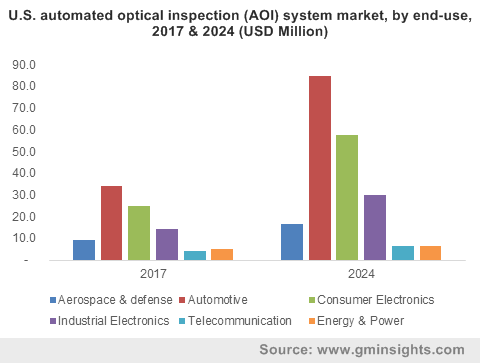 Rapid industrialization and increased demand for electronic components has propelled the automated optical inspection (AOI) system market expansion, with rise in consumption of automotive and consumer electronics. AOI systems have gained immense momentum for fast and accurate inspection of electronics assembly lines to facilitate the production of only the highest quality PCBs and surface-mount devices. Constant innovations in smartphone technologies and automotive electronics has reinforced the need for lowering time and cost of production, necessitating the involvement of the AOI system industry. Estimated to have recorded earnings of more than US$500 million in 2017, the global AOI system market will experience an accelerated growth rate from augmented industrial automation. Automation has been a trending process among manufacturers around the world, and more factories are expected to be completely automated in the near future with advancements in communication and robotics. As the field of electronics production get more competitive, achieving the balance between manufacturing speed and quality through automation is considered to be a major factor for success. The AOI system industry is crucial in providing powerful solutions to help manufacturers monitor processes and greatly improve their overall quality. AOI systems can now be integrated with robots, pneumatics and other process components to offer precision quality control. Increasing focus on consumer protection and the need for reducing the costs involved in 100% inspection process will further bolster the AOI system market. 100% inspection is critical for segments where a human life could be put at risk, for instance medical devices, portable electronics and automobiles. A while back, certain smartphone product launched by Samsung was under scrutiny due to exploding batteries which endangered the users while being charged or operated. It was found out that the leading cause of explosions was improper assembly of batteries, stressing the importance of inspection in automation. Experts believe the company could have avoided this fiasco by adopting quality inspection systems, such as AOI, for inspecting all batteries and not just samples. Speaking further on the significance of the AOI system market, electronic components are becoming smaller in size, making it difficult to perform accurate and fast checks manually. PCBs for different applications require hundreds of parts to be soldiered or mounted on them in a short period of time, needing AOI systems to inspect each and every part, either in pre-manufacturing stages or post-production. Many global industries are adopting fully-automated manufacturing processes for not only PCB production but also cars and consumer electronics. Subsequently, the AOI system industry will witness robust demand over the coming years. levels of automation that will be implemented and signifies a key application area for the AOI system market. Government rules and international standards regarding vehicle quality and safety have boosted the demand for advanced AOI systems, as they can match the complexity and speed of automated manufacturing. Over the years, AOI systems have been optimized to collect data and provide feedback so that the manufacturing process can be improved, and any suitable adjustments are made. When used during the assembly or soldering process, AOI helps to inspect the quality of the product as it is being made, which considerably lowers the need for post-production inspections. The AOI system industry can benefit from the tremendous development in optical sensors and miniaturization of inspection cameras. The enormous opportunities for the implementation of AOI can be surmised from industry estimates which peg the global process automation segment to be valued at nearly USD 50.3 billion by 2020. As more companies look towards AOI for ensuring a fast, reliable and cost-efficient quality control in manufacturing and process automation, the AOI system market is anticipated to register a 12% CAGR between 2018 and 2024. Viscom AG, Cyberoptics Corporation, AOI Systems, Nordson, ASC International, Omron Corporation and Kurtz Ersa, are some key players outlining the AOI industry dynamics. Compliance with evolving engineering standards and demand for higher quality of products will drive innovations in AOI technology. This entry was posted in Electronics and Media and tagged 2D AOI Systems, 3D AOI Systems, Aerospace & Defense, AOI System Market Report, AOI System Market Research, Automated Optical Inspection System Market, Automated Optical Inspection System Market Analysis, Automated Optical Inspection System Market Size, Automation, Automotive, Consumer Electronics, Data Storage, Energy & Power, Imaging, Industrial Electronics, Inline AOI, Lighting, Offline AOI, Printer, Printing, Reflow Soldering, Rework, Selective Soldering, Telecommunication), Wave Soldering.